1 of 3 Heat 2 tablespoons of the oil in a large nonstick skillet over medium-high heat. 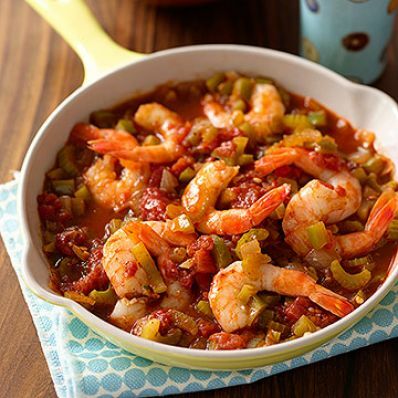 Add shrimp and season with 1 teaspoon of the Creole seasoning. Saute for 2 minutes per side. Remove to a plate. 2 of 3 Add remaining tablespoon oil, the peppers, onion, celery and garlic. Cook for 5 minutes, stirring occasionally. Scrape up any browned bits in bottom of skillet. Add tomatoes and remaining 2 teaspoons Creole seasoning. Break up tomatoes with the back of a wooden spoon. Simmer, covered, for 5 minutes. 3 of 3 Stir in shrimp and heat through. Serve with cooked rice. Per Serving: 919 mg sodium, 5 g fiber, 504 kcal cal., 22 g pro., 77 g carb., 2 g sat. fat, 12 g Fat, total, 126 mg chol.